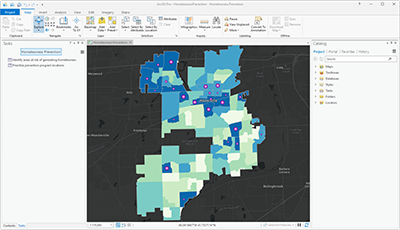 Homeless Risk Reduction is a configuration of ArcGIS Pro that can be used by data analysts to learn which areas in their community are at risk for generating homelessness, and how to prioritize and site intervention programs. In many communities data collection focuses on people experiencing homelessness and there is limited information available on where homelessness originates. Homeless Prevention leverages authoritative data and uses indicators (for example, unemployment rate, rental prices, public assistance, health insurance coverage, minority population, veterans) to compute a vulnerability to homelessness layer. The resulting risk surface is then used to prioritize intervention program siting. The results of this tool can be used as a foundation for public education and awareness campaigns, operational improvements, and policy discussions across an entire community. Homeless Risk Reduction requires specific software. HomelessRiskReduction.ppkx An ArcGIS Pro project package used by data analysts to identify homelessness risk across neighborhoods. Below are the release dates and notes for Homeless Risk Reduction.